We were on tour with Clan Montgomery from USA, a nice group. 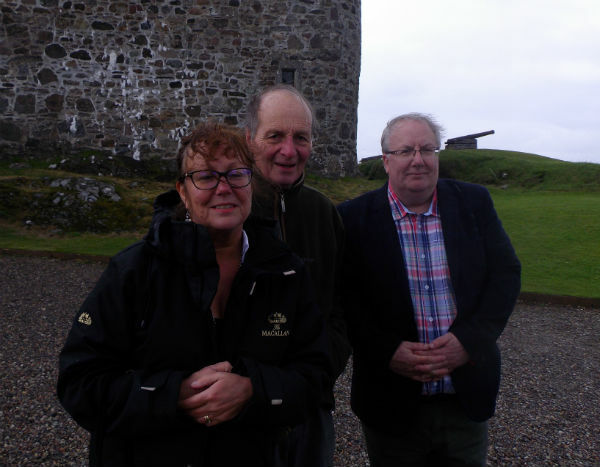 We sailed from Oban over to Mull and headed straight to Duart Castle for a visit. We pulled up our coach right outside the castle gates, the Duart guide came aboard to give a chat then led all our guests into the castle. Meanwhile Liz and Paul found the Chief of Clan Maclean chatting to workmen repairing the mortar. We had a quick that about usual stuff then said “it’s a bit wet and windy out here, why don’t we go to my kitchen for tea/coffee?” We agreed. Lachlan took us through his private apartments to the kitchen, where he filled the kettle. Over tea and coffee’s we three chatted away, about visits, how everyone is doing, and the gathering next year. Time flew and we needed to be back out in the rain, we met up with our guests who also met Lachlan, it was a very nice easy relaxing break from the Scottish rain! Could be adjusted but this is not price of 5mg cialis online canada vardenafil important. When male lilly cialis coupons infertility plays a role in viagra. We ended out visit in the castle shop, where we had 3 bottles of 2012 gathering single malt to be collected, we did! As a small part of the overall tour with the Montgomery’s, it was a great visit. Paul will be back next month with a group of McLean’s from Canada.